The flight from Manila to Hong Kong was smooth enough. Because of the limited selection of shows that I can watch on PAL’s personal AVOD system, I was able to nap on the short flight across the South China Sea. I awoke to see nothing but fog outside my window, as the captain announce that we will be landing shortly. We land smoothly, and excitement replace the exhaustion that I was feeling. We filed out the 747, and the fact that I’m in another country hits me. The signs and the advertisements were in Chinese and English. All around me, people are speaking several different languages. 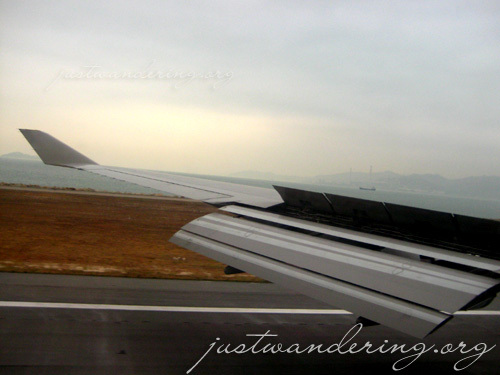 Hong Kong International Airport is HUGE. It’s easy to get lost inside, but there are plenty of signs to point you the way to the rest rooms, the immigration booths, the trains, etc. Also, there’s a tourist booth with plenty of information and maps for Hong Kong first timers. I change my sole US$100 at the first foreign exchange counter I see. I know I can get better rates in the city, but I don’t have any smaller currency that I can exchange. As I made my way to the immigration counters, I notice a sign listing items that isn’t allowed to be brought into Hong Kong. The last item on the list made me laugh inwardly: counterfeit and pirated goods. After breezing through immigration, I spy the Octopus Card booth. Kaoko lent me her MTR card, so I didn’t have to buy a card. I just topped it up with HK$100 to be used on trains, busses and convenience stores. I also bought a round trip Airport Express ticket to Tsing Yi. Kowloon is station is closer to Olympic (where I’m getting off), but upon my CS host’s instructions, I opted for Tsing Yi because it’s cheaper by HK$40. The MTR card can only be paid by cash, but you can use your credit card for buying the Airport Express tickets. 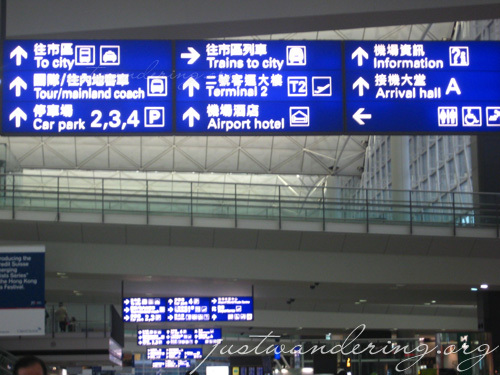 I went out the airport and followed the signs to the trains to the city. There was a sign counting down the minutes until the next train, and I get to the platform just as the train was pulling in. 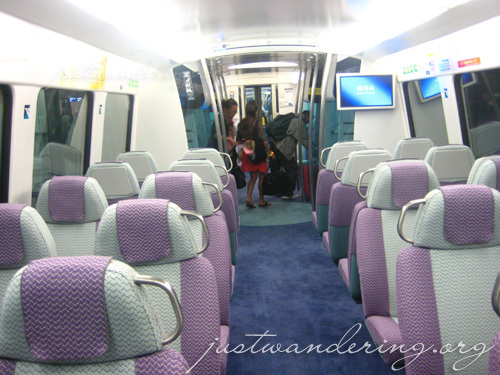 The Hong Kong airport express train was big and roomy. Maybe I’m just traveling in the off season, but the train wasn’t packed and there was plenty of empty rows. Within minutes, the train was pulling out of the station and we were on our way to the city. Hong Kong looked dark and dreary. The whole time I was in the train, I kept hoping that it wouldn’t rain — the clouds looked ominous and it seemed it would pour any minute. It turns out that the weather’s just like that. It’s overcast and misty the entire day, but it doesn’t really rain. 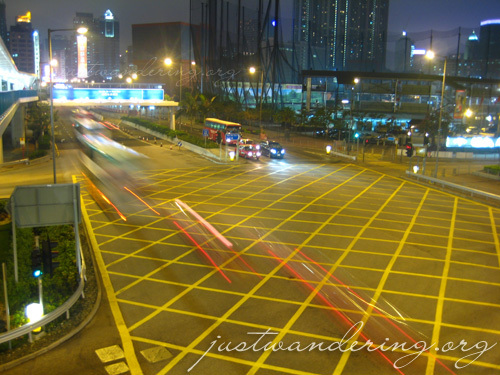 In about twenty minutes, the train pulls into the Tsing Yi station. I get off the train and into the station, once again following the signs to the exit. I emerge from the train platform to a lobby that was simply astounding. The interior of the station was not lavish or posh, but it looked classy. There’s no shortage of signs in any of Hong Kong’s train stations. I look at the station’s map to figure out how to go to the platform of the trains going to the city. I ended up even more confused. Good thing there’s an information booth and I was told to go down again to a certain level for the trains. Another twenty minutes and I was at the Olympic station. I call Vincent, my Couch Surfing host in Hong Kong from a pay phone at the station (his instruction was to ask to use the phone at the customer service booth, but I was gruffly told by the man behind the counter to use the pay phone). He told me to make my way to his apartment, since he can’t leave the apartment, as he’s waiting for the other couple he’s hosting. Thanks to Google Maps, I was able to print a map to his place even before I left Manila. Vincent welcomed me warmly into his apartment. He was genuinely interested in different countries and culture, and he asked a lot of questions about the Philippines. He’s been to the Philippines before, but only on a tour group, so he saw very little of the country. He has an atlas, and we opened the book to a map of the Philippines and I pointed out the places I have been to in map. In turn, he showed me photos of the places he’s been to. He’s traveled to several countries in Europe and Asia, and thanks to Couch Surfing and the Hospitality Club (where he’s also a member of), he was able to keep his travel expenses low. As he was about to show me the photos he’s taken around Hong Kong, he Belgian couple he’s hosting arrived (he saw them as he looked out the window of his room). The Belgians, Tim and Mandy, just went out for coffee. It took them almost two hours to get back because they were waiting for me at the Olympic station! It turns out that they wanted to surprise me at the station, because they know it feels good when you see people holding a sign with your name on it when you get out of the airport or the train station. Unfortunately, the surprise was me already at Vincent’s flat when they came in. We exchange pleasantries and we headed out to explore Kowloon. Hong Kong weather that time of the year was the same weather we were enjoying back in December and January, only with more wind and fog. 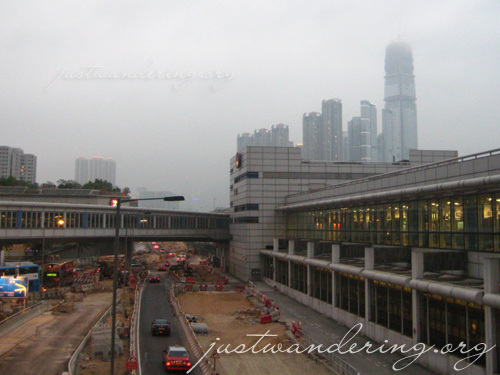 We walked to the Olympic station, and took a ride to the Kowloon Station. Like most train stations in HK, the station had plenty of stores and has lots of exits that connect to different streets and buildings. We emerged at the Civic Square and walked to the site of Hong Kong’s future tallest building. The International Commerce Center tower was set to have over 110 floors, and will be the tallest building in Hong Kong upon its completion in 2010. It’s so tall that it just disappears into the fog. The amazing thing about this building is that it’s not yet finished, yet the floors that are already finished are already occupied and operating. We had a foggy view of the buildings across the harbour, and we noticed that there’s a yellow glow in the sky. Vincent explains that because of the thick fog, using yellow lights on the buildings is more practical than white. We went down to street level and started walking through Kowloon. Vincent took us to Temple Street, where there’s a nightly street market. Like the bazaars in most of Asia, the street is filled with make shift booths filled with every kind of goods that tourists might fancy. 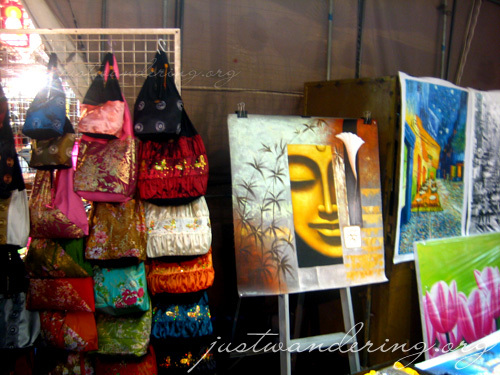 There were shops selling souvenirs, art pieces, bags, jewelry, clothes and gears and gadgets. In almost every corner, there are small restaurants where you can eat if all that shopping made you hungry. We finish the market and we walked around the residential areas. I was reminded of Singapore — tall apartment blocks with playgrounds and exercise contraptions. 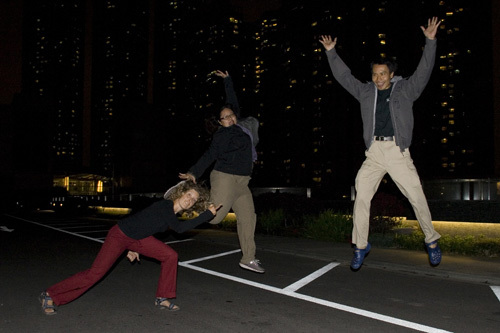 One thing that was startling about Hong Kong was that even though it’s dark, it’s not really dark. Sure, the sky is pitch black, but at the street level, it’s so bright due to the street signs and the lights from all the buildings. It was light pollution, as Tim calls it. We walked and walked and walked and before we know it, we were back in Vincent’s street. Everybody was pooped, but not pooped enough to enjoy some beer. The times that I can actually enjoy beer is few and far in between, so I just popped into the shower. When I got out, I took out my laptop to transfer photos. I also showed them photos from my previous trips, so they can get a glimpse of the Philippines. Unfortunately, I’ve moved some of my photos to my external hard drive to free up space, so I was only able to show them some of the places I’ve been to. Around midnight, we adjourned, and we set up my mattress on the living room floor (as the Belgians were already occupying Vincent’s guestroom). My head was facing the window and I can still see the bright yellow glow in the sky. I really must bring a sleeping mask next time. wow! how i wish i can visit HK someday.. wooooooot! I’m with Amanda, as well: what’s with the yellow crisscross street things? I’m intrigued. I need to go back and count how many times you’ve mentioned “fog” or “foggy.” LOL. Did you know the weather would be like that when you left? Also, what did you pack in the way of traveling clothes? I haven’t checked to see if you posted what was in your bag on Flickr—I love it when you do that. Gives everyone an idea of what to pack. Amanda: Dude, if you can still remember your LJ password, log on and read my recent posts I can’t offer any couches in my house, but I have a standing invitation for coffee and a tour of Manila. nice write up. yeah airport express is very efficient. in fact, the whole MTR system in hong kong is! i always wanted to try this couch surfing system. hope i can do this some day! If I may ask, where did you stay or where can I find an inexpensive hotel in HK? Good for 2, affordable, safe and within the Kowloon city. it’s nice that you were able to promote the philippines to them. i think it comes out naturally to the many frequent travelers. you just love the philippines. the seats inside the express looks so relaxing that you wanted to stay there for hours. i love your pictures and your narrations. it makes me feel as if i’m back in hong kong. i am wondering how one could be a member of couch surfing? i plan to go back to hong kong soon but i am on a tight budget. HI, i read through ur blog ,is kind of surprising me .. i wanted to fun in hk on april , and i notice that ur couch surfing friend not bad.. can intro to me ? Actually, I wouldn’t recommend my host there. owh really , where did u get this from? I spent 2 days with my host. Based on my experience, I will not recommend this host to anybody.